Soggy kind of day, originally uploaded by captainjay. 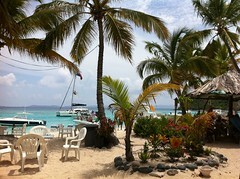 We took off on the boat today and headed to Jost Van Dyke. We have a newbie with us, first time our of the USA. And several other friends. It's a beautiful day, flat water, all around perfect day.